We listed up our recommendations for you ! MonotaRO offers Pin Spanner Wrench and more. You can buy them anytime from our Singapore online store. 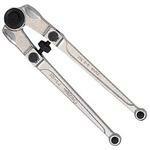 See more results of "Pin Spanner Wrench"
You will find Wrench rack ( for spanner / glasses wrench / combination wrenches) and Ratchet Wrench Parts and more ! You will find Pin Spanner and Entrance Opening: 18-100 and more ! Want OP Film and Gift Wrapping Paper ? Click Here. Plastic Shopping Bags and Plastic Shopping Bag and others, don't miss it !